Audiences at the “Salón de Consejos” in the Reconquista Hotel. 11.30 a.m. Prize winners of the Principality of Asturias Medals of 2010. 11.50 a.m. Representatives of the towns bestowed with the Exemplary Town of Asturias Award in the last 20 years (1990-2009). 12.10 p.m. Winners of 2009 University of Oviedo end of Degree Awards. 01.10 p.m. Representatives of the Women’s Football Club Oviedo Moderno C.F. 05.00 p.m. Board of Patrons of the Santa Barbara Occupational Foundation for the Disabled (FUSBA) and representatives of its workers. 8.00 p.m. T.R.H. The Prince and Princess of Asturias chaired the closing concert of the XIX Music Week, organized by the Prince of Asturias Foundation and Cajastur. The concert was held at the Prince Felipe Auditorium in Oviedo. Maestro Maximiano Valdés conducted the concert. T.R.H The Prince and the Princess of Asturias met the Juries&apos; chairpersons, the members of the Prince of Asturias Foundation Board of Trustees and the 2010 Prince of Asturias Awards Laureates. 6.30 p.m. 2010 Prince of Asturias Awards Presentation Ceremony. 11.30 p.m. Visit to Llastres. 12.40 p.m. Institutional Presentation Act of the 2010 Exemplary Village of Asturias Award to Llastres. 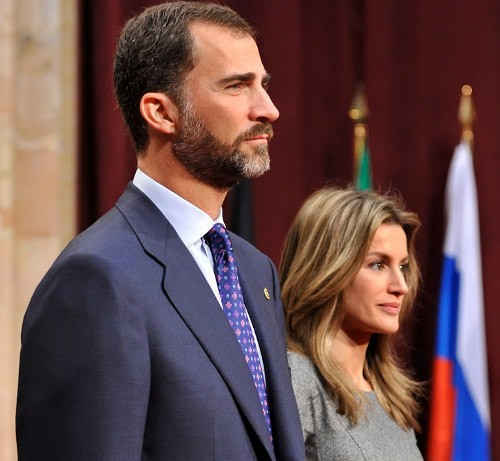 T.R.H The Prince and the Princess of Asturias met the Juries' chairpersons, the members of the Prince of Asturias Foundation Board of Trustees and the 2010 Prince of Asturias Awards Laureates.